We knew this day was coming already over a year ago. 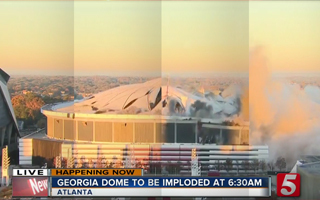 Georgia Dome was initially planned to be demolished bit by bit but the mode was later switched to implosion. This meant cutting the demolition period from weeks to just seconds. Earlier today, at around 7:30 local time, a series of explosions caused what was was seemingly an earthquake and a rough wake-up to thousands of local residents. The entire perimeter of Georgia Dome's roof was packed with a total of 2.2 tons of dynamite. It took just 12 seconds from first burst to the last one but once the massive cloud of dust and smoke cleared away, it was revealed that part of the eastern end didn't go down as planned. It will now be examined and demolished by other means. Aside from that mishap, over 190,000 cubic meters of concrete went down very gracefully. Now the clearing period begins, expected to result in plain ground within 3 months, laying groundwork for a 1,010–room luxury convention center hotel serving the adjacent Georgia World Congress Center. Groundbreaking is scheduled for early 2019. The site also will include a new 600-space parking deck and The Home Depot Backyard, a 13-acre greenspace designed for game day tailgating at Mercedes-Benz Stadium and community programming on non-event days. Georgia Dome ended its existence after just 25 years. The very last event was held on March 5, 2017. Afterwards all removable equipment was relocated to make way for today's implosion. The stadium was no longer needed after Mercedes-Benz Stadium opened its doors earlier this year. New NFL stadium consumed almost 8 times (!) as much as Georgia Dome ($1.6 billion compared to $214 million) and is now the world's most expensive stadium ever built.